Coaches, Leaders, Entrepeneurs and Network marketing gurus. Learn the pillars of success to kick start your journey on using public speaking as a marketing tool for your business. Learn & implement the 4 pillars of success to create results in your business immediatly. This is an exclusive up and close training with Master Coach Janelle Johnston where you will receive one on one coaching to transform your public speaking skills instantly. Are you a Passionate Business Owner that wants to escalate your Speaking Skills? Would you like to be known as the Leader in your field so that you can attract more clients, increase sales and have higher cash flow in your business through conducting World Class training workshops, being the keynote speaker at an event or being able to network like an expert? You're good at what you do and you are passionate about building a successful business. But you're frustrated that it's a never ending battle to get more clients and you lie awake at night worrying about the bills you need to pay and if you have enough money to survive. So far you have been focusing on getting that next client but it feels like you are always chasing your clients and you have heard that the most successful business owners out there are utilising the power of speaking as a strong marketing & branding tool. You are constantly networking & using social media to promote your business but not getting the results that you expected. It’s exhausting. You dream of the day that your business is a success and that you have more freedom & financial abundance in your life so that you can make an even bigger positive impact in the world. How can you have it all? If you keep doing the same things that got you here today then you will continue to get the same results. But how can you make a change when you don't know what path to take? It's not your fault and you're not alone. There is a solution for you right now that will give you more effective visibility out there in the market place so that you are seen as the "Go to" person in your industry and your ideal clients will be flocking towards you. We've specifically designed a Speaker Training course that will dramatically increase your brand exposure and increase the sales results in your business in a rapid amount of time. Being confident when speaking to a group of 2 or more people is easy when you learn some simple strategies. If this sounds like you, you will love this training. Will I just learn about public speaking in this training? Oh you will learn so much more. You will learn simple strategies of self-empowerment that will help support you in all other areas in your life. What level of experience do I need for this training? Finding your Voice training is for those just starting out, to those that have had some experience in speaking and want to continue to develop their skills even more. It is not for the seasoned professionals. We have our more advanced speaking courses, Empowered Speaker and Masters Facilitation course that is suitable for the more advanced. Will Janelle be at the live training? Yes, you will be coached directly by Master Coach Janelle in the room. She will be there to support you & challenge you to success. Do I have to stand up in front of people and speak? No..I understand you may feel a little nervous, that is so normal and exactly the reason that you are perfect for this training. You are completely in charge of what you decide to do in the room. By the end of the training day, you will be itching to stand up and speak. Does Janelle do private coaching for Public Speaking? Yes however there is a waiting list and Janelle only takes 5 one to one clients per year. With Public Speaking, the learnings are intensified when you are practicing in front of a live audience which makes the group training and ideal learning platform. Janelle Johnston is an International Speaker & Leadership Trainer with extensive experience as a Human Behavioural Specialist working with top companies & individuals to achieve peak performance. 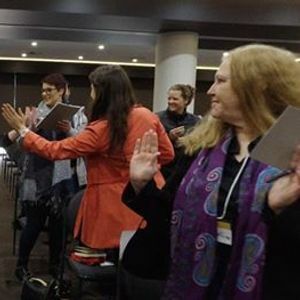 Janelle is committed to self-development and is a Transformational Life Coach, Speaker, Leadership Educator, Trainer & Master NLP Practitioner, Master Deep State Re-Patterning, Master Hypnotherapist, Accredited Extended DISC® Behavioural Profiling Consultant/ Trainer, Accredited Cert IV Trainer & Assessor and Landmark Graduate. JJ, as Janelle likes to be called, has studied with the leaders in Personal Development from Dr Demartini, Benjamin Harvey, Anthony Robbins, Taki Moore & Sharon Pearson. She has travelled to many different countries around the world and had over 20 years experience in the Personal Development space. Janelle is constantly researching & up skilling to enable effective delivery of cutting edge training & advanced coaching for her clients that exceeds their expectations. JJ has worked with clients such as Melbourne Airport, Freedom Furniture, Territory Discoveries Travel, Australia Post, The Good Guys, McDonalds, just to name a few and coaches individual clients & facilitates training programs all around the world. “My personal mission is to assist companies & individuals to BREAKTHROUGH any barriers that are limiting their potential & to implement strategies that achieve Outstanding Results. I have a burning insatiable Passion to stretch people & accelerate their learnings so that they can BE MORE & HAVE MORE of what they want in their life. As a Human Behavioural Specialist, I thrive on Innovating & Creating programs that will expand thinking, develop skills & create results that are beyond the expectations of what was even first thought possible. It gives me great pleasure to delight & surprise my clients with the Rapid Transformation that is achieved through tapping into the resources that are already within them together with implementing strategies of personal excellence. 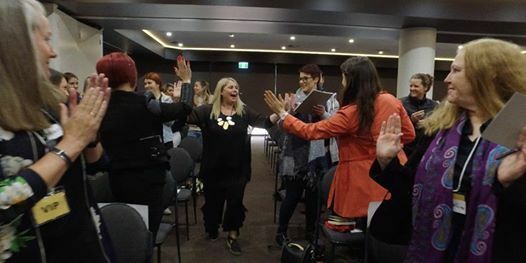 Janelle has worked with clients such as Mars, Wrigley, Melbourne Airport, Freedom Furniture, Territory Discoveries Travel, Australia Post, The Good Guys, McDonalds, just to name a few and coaches individual clients & facilitates training programs all around the world. "Before doing the speaker course with Janelle I was nervous and afraid of not only public speaking, but approaching people at networking events. Since finishing the course, I have been attending networking events which resulted in 3 guest speaking invites. One of those was a gala event with 200 people. It has completely transformed my business."